status Archives - Daniel Mankani "DynamicTrader - Trend Trading Dynamics"Daniel Mankani "DynamicTrader – Trend Trading Dynamics"
USDJPY last 77.60. Continued consolidation in USDJPY above 77.50 and below 77.80 for the past two trading sessions have failed to make any head way, to the upside, nor have provided any signal that a short term peak is on hand. Our Bias remains to the upside and am expecting a break of 77.89 to confirm a potentially longer term low is in place and larger move to the upside develops. Its hard to see the catalyst for this, but most ideally, it could be BOJ, which is meeting today and tomorrow and in light of the lower than forecast recently released GDP numbers, weakening the yen could be on the cards. Steve Jobs thoughts on Life. USDJPY last 77.67. Judging from the recent moment in this pair, it has been a strong momentum filled upward movement, that has failed to provide any dips for those, who missed to get in or remain short. Now that the dollar has its focus on 77.89 key resistant area, some sort of consolidation shall prevail and there after, expect a break that has the potential to even take out 78.30. A sustained move above here, signals a potential low is in place and targets 79.52/80.23 next week. There are reports circulating that Japan's Pension Fund (1.3T US), may consider investing in overseas assets to dampen the strength in the YEN. 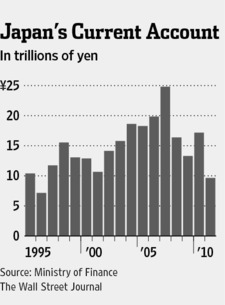 If so more good news for Japan and those who are long the dollar. Last 77.23, testing key resistant which runs thru all the way from here upto 77.30, expected to give way, for a quick run up towards 77.58/77.70, eventually we should take out 78.30 within a week. Failure here, puts 77.00 into focus. raising stops just under here. Last, 1.5833. A potential top could be in place in Cable with yesterdays high of 1.59+, cable seems over extended, Now 1.5860 Pivotal has to hold for another attempt to the downside. Key support is 1.5790 region, Only a sustained move below here, will make us to call a top, and look for 1.5732/1.5612 as lower level targets. Japan's current-account surplus shrank at its fastest rate on record in 2011, as exports stumbled and energy prices soared, leading to the first shortfall in merchandise trade in decades, government data showed. The result was partly due to extraordinary events such as the March earthquake and tsunami in Japan, but economists say that the yen's persistent strength and a growing reliance on expensive energy imports mean the picture won't improve anytime soon. USDJPY - 77.09 - The yen now looks like the funding currency, in light of yesterdays RBA move, weaker across the board with the US dollar, technically, testing above 76.80 puts 77.30 into focus, may not give much trouble, if so, then look for 78.30 to provide some relief. Only a sustained move above here, signals potentially a bottom is in place. How does Dodd Frank Affect you?